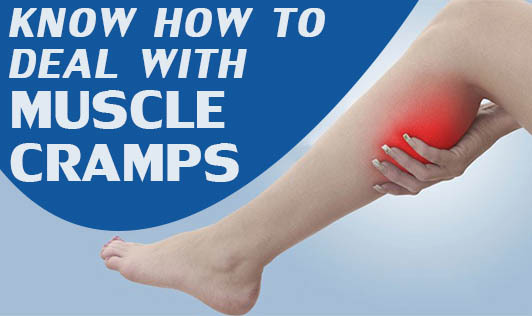 Know how to deal with muscle cramps! Muscle cramps are sudden and involuntary contraction of one or more of your muscles causing agonizing pain. Overusing a muscle, dehydration, muscle strain or simply holding a position for a long period of time may result in muscle cramp. However, in many cases, the exact cause of a muscle cramp isn't known. • Gently and slowly stretching the affected muscle can relieve pain. • A hot shower or using hot packs can increase blood circulation in the affected area thus relieving pain and tension. • Massage the affected area for relief. • Don't over exert your body while exercising or doing any other physical activity. • Be well hydrated as many experts suggest that dehydration is the leading cause of muscle cramps. Fluids help muscles contract and relax and keep the muscle cells hydrated and less irritable. • Always stretch before and after exercise. • Eat foods rich in vitamins, magnesium and calcium. • Move around as inactivity is also a cause of cramps. • Excessive fatigue especially in warm weather should be avoided.